From the Makers Mouth: Grove 45 Extra Virgin Olive Oil — TASTE. SAVOR. SHARE. I remember reading about Grove 45 Olive Oil when it first came to market, and immediately called hoping to procure some for The Savory Pantry. I was told, quite politely, that the oil was in very limited production and the initial harvest was completely sold out, but that I could check back again the following year! I followed up early after that next harvest, and was thrilled to be able to get a couple of cases of oil. 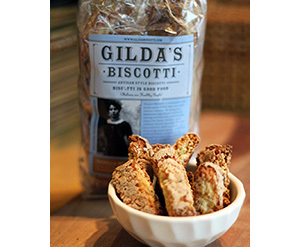 Since that time, it has become a favorite of our customers as well asall of us in The Savory Pantry. Grove 45 has achieved a cult-like following in a few short years. What sets your oil apart from other California olive oils? Grove 45 Extra Virgin Olive Oil is a robust, pungent oil. Our trees were imported from Tuscany and they produce a bold style oil with a big pepper punch at the finish. Also, we purposely harvest very early to avoid a freeze which will ruin the crop. Harvesting early produces a more robust and pungent oil since more of the fruit is unripe (green). The 2013 harvest ripened early with much higher oil content than normal. Due to this the 2013 oil is softer, considered medium robust, and will most likely have a more universal appeal to the consumer. What has been your biggest challenge in bringing your product to market? Not having enough product. We are a very small producer. We were fortunate to have been “discovered” by a nationally circulated magazine in our first year of production. The instant demand created could not be entirely met by our production quantities. It is a challenge to satisfy our existing and prospective customers. What is it about what you do that you love the most? We love the fact that we do it all. Bonnie is the farmer and drives the tractor and Nena is the office and drives the computer. We haul olives to the mill and bring the oil home to rest. We deliver the oil and all of the bottling supplies to the bottling line and bring the finished product back to the ranch where we then hand apply all of the embossed pewter labels. We enjoy going out on the road and visiting our accounts. Except for pruning and picking we do it all; we are the company. You take the time to personally visit your accounts each and every year. Why is that so important to you? We feel it is very important for the people who buy our oil and their employees to put a face together with the product. 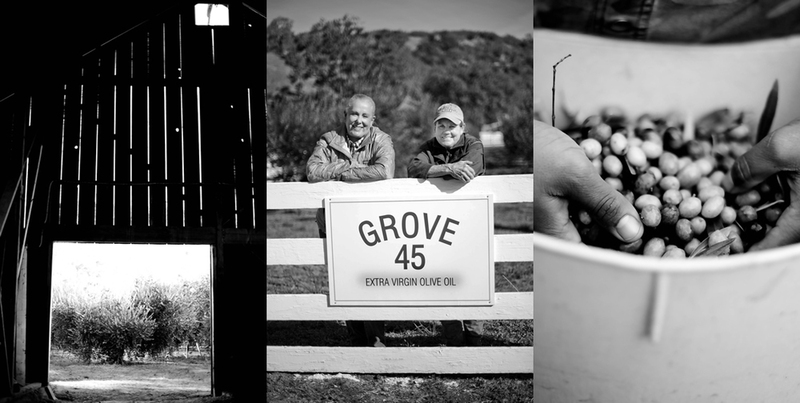 Grove 45 EVOO is a story as well as a product. Personal service can make a big impact in a crowded marketplace. This year we plan to visit as many accounts as possible. How do you most often use Grove 45? As often as possible! We use Grove 45 EVOO instead of butter on everything, on salads of all kinds and as a garnish on soups, stews, beans, etc. What is the most unexpected way of using your product? It’s funny, each of our “go to” snack is air popped popcorn generously drizzled with Grove 45 EVOO and sprinkled with sea salt, truffle salt or garlic salt. What is your most memorable meal? On a bicycle trip in Spain a few years ago. A few days into the trip the guides told us we would be hiking to a very special place for lunch. After trudging along a precarious trail in the scrub brush our restaurant came into sigh…El Bulli! No joke. The meal was a riot of molecular food the likes of which we had never seen or tasted before. Amazing, we will never forget the experience. What is your favorite food or food trend? Bonnie is a big fan of pasta. She keeps it very simple usually sautéing garlic, mushrooms and sage. She likes pappardelle pasta. Then she likes to finish it off with a generous amount of Grove 45 EVOO of course and a grating of parmigiano. Nena likes cheese, almost any kind. She drizzles some Grove 45 EVOO on mozzarella, parmigiano or a truffle cheese for a snack or when she is entertaining. We both like to check out the newest and most talked about foodie spots and restaurants when we are traveling. It is a great opportunity to discover what is happening in the food scene around the country. What is your (food) guilty pleasure? For Bonnie; bring on an ole’ rib eye and don’t forget the frites! She doesn’t do it often but will not pass up the opportunity at a restaurant known for it’s meat. You are both exceptionally strong women, how has that helped you build your brand? We are at an age and a place in life where we are not afraid of much. We believe in our product and we have a great time working together and telling anyone who will listen about Grove 45 EVOO, how we started our business and how we operate. It is much easier out in the market place to be two rather than one. What would be your advice to others who might be trying to bring a product to market? Lead with your passion and enjoy the process. Design a unique, appealing and eye catching package. Research your market and decide where you would like to do business. Most of all, have fun!